I often wonder how wineries can afford all the different types of equipment needed for that precious nectar to go from grape to the bottle I enjoy with dinner. If you’ve ever been to a winery, you’ve probably seen a press, tanks and barrels. But there’s also a raft of special-purpose equipment involved in bottling and labelling. If a winery can’t afford their own bottling equipment – or if they don’t want to tie up precious space for equipment they may only use a few weeks a year – they have to make alternative arrangements. Sometimes that means shipping their wine via tanker to another winery for bottling. Turns out, another alternative for wineries is Hunter Bottling, a company that’s been offering mobile bottling services for about 15 years. A number of Ontario wineries use them (particularly in the Niagara region, which is where Hunter started). Intrigued by the idea, I began asking around to find out more about Hunter Bottling and their services. I soon found out that Malivoire Wine Company uses them. So, since Malivoire’s winemaker Shiraz Mottiar is very approachable, I dropped him a line and he put me in touch with Glenn Hunt, founder of Hunter Bottling. Mottiar was also kind enough to let me stop in (in mid-May) and see the bottling line in action. Click Here to watch a short video of Hunter Bottling at work bottling Malivoire’s 2016 Gamay. Special thanks go to Mottiar for explaining the process and to the crew of Hunter Bottling who let me into the truck as they worked. Glenn Hunt, who grew up in St. Catharines, was in the winery business long before he started Hunter Bottling. Early in his career he focused mainly on the sales and marketing side (though he also had a successful virtual winery for a while). He was working at Hillebrand at the time Peller (the owner of Hillebrand) was building Peller Estates’ winery on East-West Line in Niagara-on-the-Lake. To satisfy regulations that required Peller to conduct a certain amount of processing on-site at their wineries, Peller had the idea of transporting its bottling line between its two properties: Hillebrand and Peller Estates. So, it outfitted a 53-foot semi with a bottling line. Because Peller’s mobile bottling trailer sat idle for a fair bit of time, Hunt approached Peller with the idea of him renting the truck from Peller and offer bottling services to other wineries. Peller was agreeable and so in 2002 Hunter Bottling debuted, using Peller’s truck. 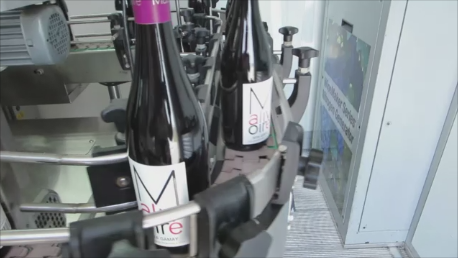 At about that time, Martin Malivoire was thinking about putting a mobile bottling facility together. Malivoire’s idea was to put the bottling line in a smaller truck, as not all wineries have the space to host a full-size semi. Malivoire designed a line that would work in a truck’s 22-foot box and Hunt bought the plans from him. Hunt affectionately described the original 22-foot box as a cute little truck and Hunter Bottling used it for quite some time. In 2012 they expanded it a bit and its current fleet is three trucks, each with a 28 foot box (40 feet overall). In Ontario, Hunter Bottling focuses mainly on the Niagara region, though they also service wineries in various “emerging regions” of Ontario. As well, they service a number of wineries in Virginia. They’re also the Ontario sales rep for the French bottling equipment maker they use for their bottling lines. And, in case you’re wondering – as I was – Hunt says each fully outfitted truck costs about $750,000. Obviously, it’s quite an investment. 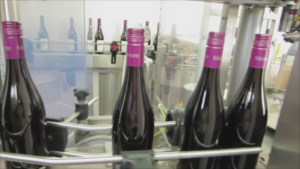 So, it’s no surprise that for many wineries it’s more cost effective to hire Hunter Bottling, rather than invest in equipment for a bottling line that sits idle much of the year. Mottiar says that on bottling day, Hunter Bottling’s truck typically arrives at the winery at about 6 a.m. It takes Hunter about 90 minutes to set up and by 7:30 or so, they’re ready to start. 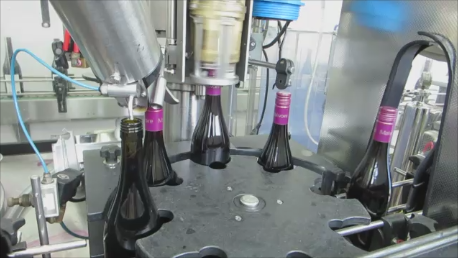 The bottling activity involves a combination of winery staff and Hunter staff. Malivoire’s retail staff does the repetitive manual work on the line – things like loading the empty bottles onto the line, taking the full cases of wine off the line and onto the pallets for storing/shipping. Hunter’s staff runs the equipment, cleans it out between runs, and so on. In terms of the speed of the process, Mottiar says it averages about 3,000 bottles per hour. A variety of factors impact the speed, including some variables I wouldn’t have considered. “It can depend on the wine – some flows quite easily. Reds with some age, for example, usually flow very well. The bottle shape also impacts how fast the bottle is filled, as does whether we’re using a screw top or cork,” said Mottiar. Another interesting variable they’ve had to contend with is labels that don’t want to adhere. If the wine is too cold, for example, the bottles sweat and then the labels don’t always want to stay on. The day I was there was unusually hot and the stainless steel tank holding the rosé they planned on bottling later that afternoon was starting to sweat. 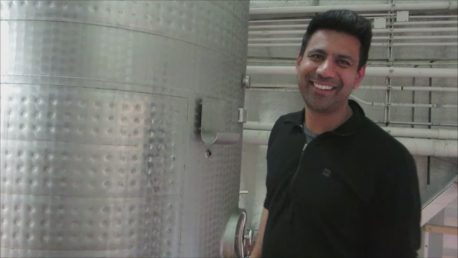 To compensate, Mottiar thought that they’d probably end up having to turn on the air conditioning in the bottling truck to lessen the chance of the bottles sweating.